* Mendota Products makes it easy to keep your pet safe. * Night Viz Reflective Leashes allow you to safely walk your dog at night or in low-light situations. * You and your pet will be visible to oncoming traffic from a distance. * Made of our popular and durable polypropelene rope infused with Retroglo 3M Scotchlight Reflective Material that won't fade, Night Viz Reflective Leashes are intended for many years of use. * Available in Night Viz Black and Night Viz Blue and accented with brushed-nickel hardware and authentic leather, Night Viz Reflective Leashes are 1/2" in diameter and come in both 4' and 6' lengths in our popular Snap Leash as well as our signature British Style Slip Lead. * Strong, durable and reflective. 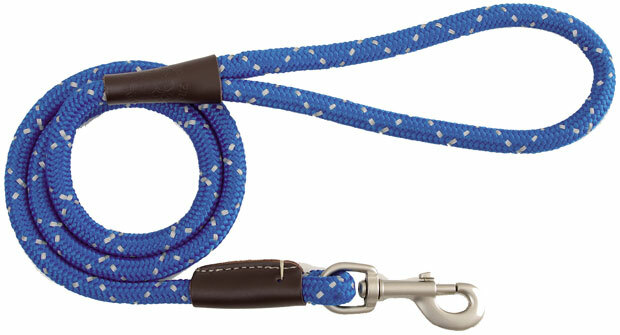 * Night Viz Reflective Leashes are an easy way to keep your pet safe!